I am a huge Seinfeld fan. There are only a few episodes I haven’t seen. And no matter how many times I watch it, I laugh at the same jokes every time. A recurring theme was the use of Serenity Now during stressful moments. For some reason that popped into my head as I was reading tweets complaining about the repeated snowstorms battering the Northeast. One woman even said, “I wish Mother Nature would get her act together.” I laughed. It did, however, make me think about how many layers I’ve been wearing and how stuffy the air around me is. Cracking a window, for starters, is a quick way to flush out stale, dry air. But as the temperature inside drops and you’re inclined to shut it tightly, a nice refreshing scent will liven up the room and your mood. 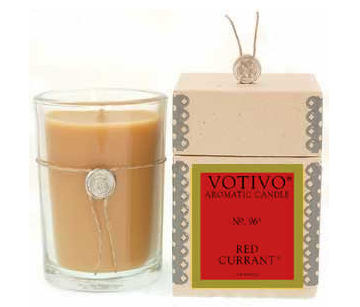 Enter Votivo’s Red Currant. Floral, light and crisp it can transform your space without weighing it down. I love using the room spray after cleaning up the place and I now realize why. It brings a renewed air of calm. Serenity now. To keep that moment of peace lingering longer, try the candle as it burns for about 50 hours. This entry was posted in Uncategorized and tagged floral scents, fragrant candle reviews, red currant, refreshing scents, scented candles, votivo candles, winter scents. Bookmark the permalink. sounds divine! I definitely can relate to the “stuffy” winter feel. I will definitely be on the lookout for this Votivo. I’ll need to switch up from “fresh bamboo”. Oh, it’s a classic! I always come back to Votivo Red Currant. Thanks for the reminder! I have given my mother many, many candles over the years. Each time I visit I’m saddened to see them barely touched. Great fragrances and products that most would love to have being unappreciated. Votivo Red Current, however, is the FIRST candle she’s actually finished! AND asked for a new one! To please my Mama – now THAT is impressive. What a lovely story Susan. Your mother knows what she likes and Red Currant is an awesome scent. Thanks for sharing.